In 2013 AECm acquired an abandoned urban property located in downtown Newmarket, NH on the Lamprey River. The former F.E. Lang Blacksmith building was vacated in 2008 and the neglected property became an urban blight. The property development consisted of two independent projects: the historic restoration of the F.E. Lang Blacksmith shop for mixed-use and Lang’s Wharf Townhouses, a four unit multi-family townhouse development. The F.E. Lang Blacksmith building is listed on the National Register of Historic Places and lies within Newmarket's Historic District. AECm’s mixed-use restoration design was approved by the New Hampshire State Historic Preservation Office (SHPO) and the U.S. National Park Service making it eligible for Federal Historic Tax Credits. The restoration of the F.E. Lang Blacksmith property included a historic architectural review of the building and an extensive archaeological site investigation in accordance with the New Hampshire Division of Historical Resources standards. 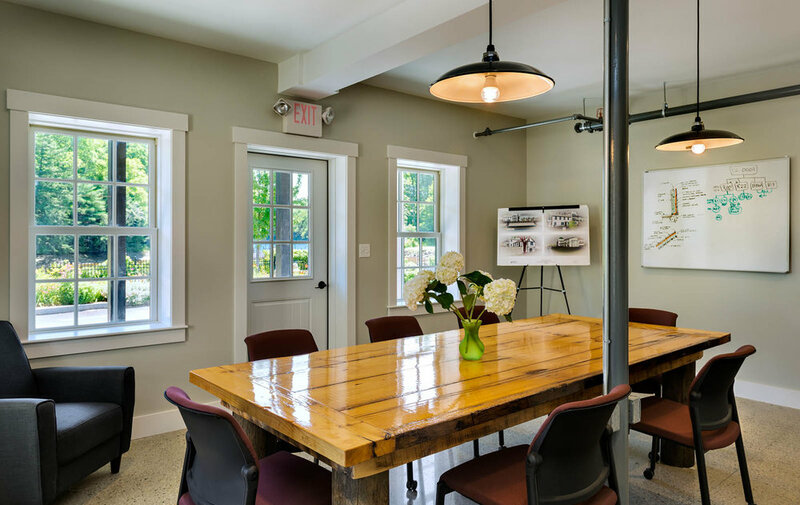 AECm received several awards and recognition for the project including Best Adaptive Reuse Conceptual Design (Plan NH and NH Housing Authority) and the Preservation Achievement Award (NH Preservation Alliance).